Facebook has been highly active lately, rolling out new services and features for its users. The company has introduced new features such as better photo tagging, using Sony Music for videos, and better groups. Furthermore, there are talks of the company rolling out its own cryptocurrency, as well as its own smart-home video calling device. In addition, the company is also making big headway in tackling the issue of fake news that’s plagued it ever since the US presidential elections. This is the reason behind the featured named “Today In”, which now part of Facebook’s official app in select regions. The feed shown in this is made up entirely of local news, events, and announcements. As reported by Recode, the feature is currently in the testing phase and is available in a total of six cities for now: New Orleans; Little Rock, Arkansas; Billings, Montana; Peoria, Illinois; Olympia, Washington; and Binghamton, New York. Users residing in those areas with the location set as the same will be able to access the new news section to see the local information. This includes stories from local publishers, sports news, as well as emergency updates from local authorities. 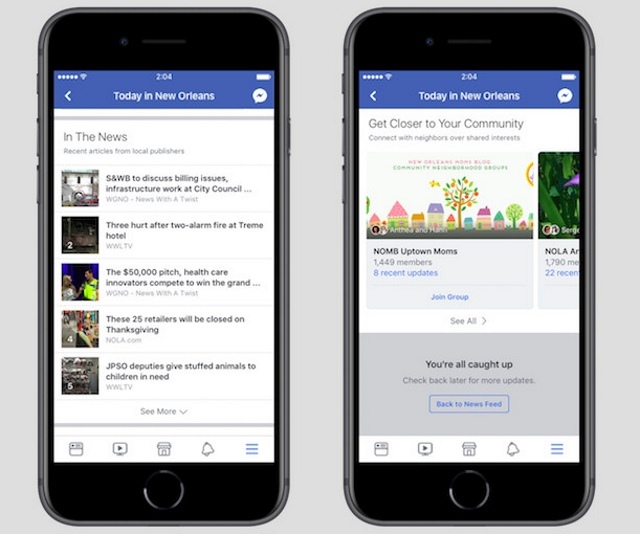 “Today In” comes as a part of Facebook’s Journalism Project Initiative, that has been done to tackle and eradicate fake news from the social network. The company claims that they’re using machine-learning software for providing content in the feed. Local news publishers who appear there will all be approved and vetted by the company’s News Partnerships team, which will be overseen by former NBC news anchor Campbell Brown. 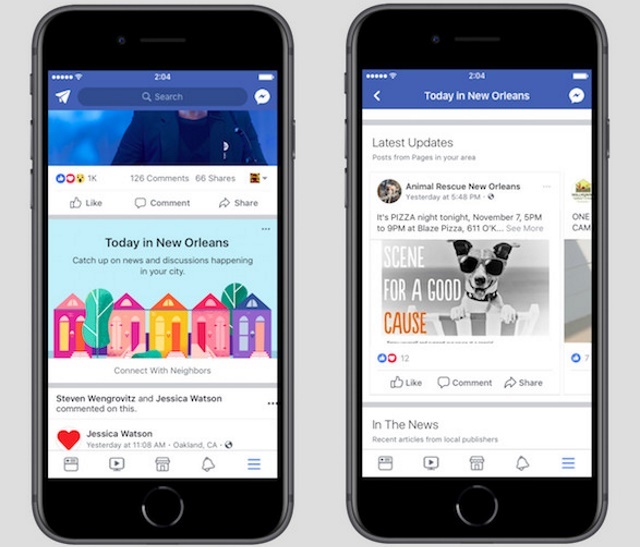 While the feature is currently in the testing phase only, Facebook has promised to soon release the feature to more cities. Furthermore, the company also intends to allow the users to follow local cities they don’t currently reside in. All things considered, this seems to be a nice step forward by the team in the pursuit to eradicate fake news. However, which news items are shown and which aren’t could still be a little problematic in the long run. The feature is currently located within the menu (☰) section, where Facebook has plenty of other unused features. If you reside in one of the above mentioned six cities, do try out the app and let us know your thoughts on the same in the comments down below.